There are those who would have you believe that Islamic law, or sharia, is taking over America. They seem to allege that the 1 percent of the American population that is Muslim is on the verge of a total takeover of the United States, and if Americans are not vigilant, soon we’ll all be stoning adulterers and chopping off the hands of thieves. If that kind of hyperbolic statement sounds ludicrous, it’s because it is. 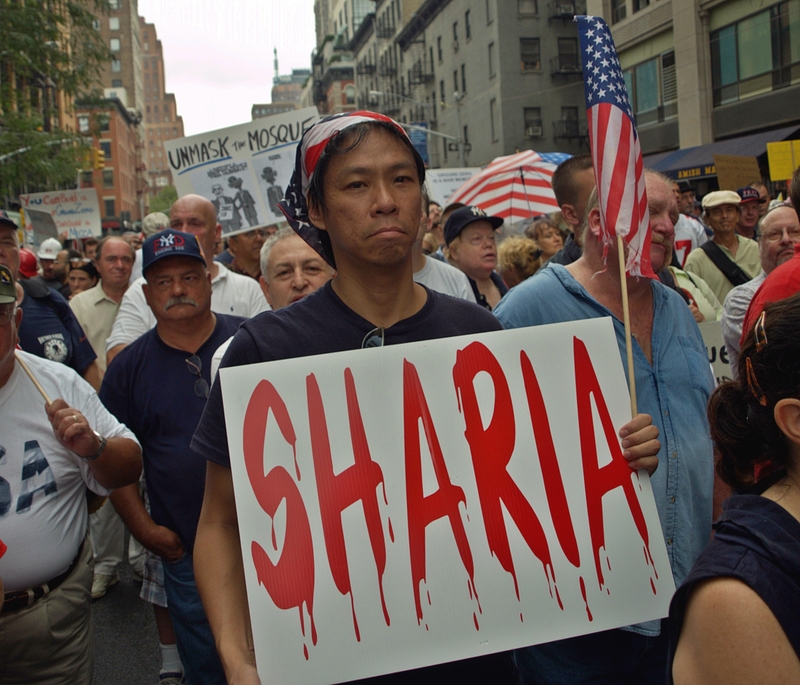 Yet nearly two-dozen states have proposed legislation to prohibit the use of sharia. Yes, it is clear that all of these laws will share the fate of Oklahoma’s anti-sharia law, which was blocked by a federal court on the grounds that it was both unconstitutional and an attempt to solve a problem that does not exist. (Proponents of the measure could not cite even a single instance where an Oklahoma court had applied sharia law.) But the very existence of such laws is an indication of how disturbingly mainstream sharia hysteria has become in the US. Perhaps no political figure exemplifies this reality better than Newt Gingrich, who has made a constitutional amendment banning sharia in America one of the cornerstones of his presidential campaign. Mr. Gingrich has called sharia “a mortal threat to the survival of freedom in the United States and in the world as we know it.” He claims, rather fancifully, that Muslims in the US want to manipulate sharia into US legislation. If the former Speaker of the House wants the job of enforcing the Constitution, he should read Article VI, Clause 2 (also called the Supremacy Clause). It establishes the US Constitution as “the supreme law of the land,” making it impossible for any foreign law to supersede American law. Passing a Constitutional amendment banning sharia in the US would be akin to banning Americans from riding unicorns. On this point let there be no confusion: It is utterly impossible for sharia to “take over” America. Anyone who says otherwise has failed high school civics. Still, many Americans continue to fear sharia because of the brutal penal codes they see enforced in countries like Iran, Afghanistan, or Saudi Arabia. The draconian laws enacted by these countries – such as stoning for adultery or punishments against blasphemy and apostasy – are nowhere in the Quran and have no place in the modern world. All Muslims who support justice and human rights should fight their implementation. But what happens in Iran, Afghanistan, or Saudi Arabia is not an indication of how Muslims in the United States practice their religion. American Muslims are just as unwilling as non-Muslims to accept sharia as a form of penal or civil code in the US legal system, according to a new study by University of Windsor law professor Judy Macfarlane for the Institute for Social Policy and Understanding. That said, it is important to understand that sharia is not just a set of punishments. Sharia is a comprehensive code of conduct that guides Muslim beliefs and practices. When Muslims wash their hands and feet before praying, that is sharia. When they refrain from eating pork or drinking alcohol, that is sharia. When they greet each other and say, “As-Salam Alaykum” (peace be with you) that is sharia. When Muslims marry, or have children, or get divorced, or die and are buried, they do so according to the principles of sharia. Millions of other Americans – Jewish, Catholic, Mormon, and otherwise – follow religious codes in their daily lives and actions. That is why the federal court blocked Oklahoma’s anti-sharia legislation. It is why all the similar laws being debated across the country will also ultimately be blocked. Muslims, just like all other religious communities in America, have the right to rely on their own religious laws to govern their day-to-day lives, as long as those religious practices do not inflict harm on others or violate state or federal laws. Religious freedom is the law of this land, and those who seek to overturn it for one particular religious community or those who try to exploit sharia hysteria to foster fear of Muslims in the US not only fail to understand sharia. They also fail to understand America and the ideals of religious freedom upon which this country was built. Reza Aslan is founder of AslanMedia.com and author of “No god but God: The Origins, Evolution, and Future of Islam” and “Beyond Fundamentalism: Confronting Religious Extremism in the Age of Globalization.” Harris Zafar is the National Spokesperson for the Ahmadiyya Muslim Community – America’s oldest Muslim organization – and frequent lecturer about Islam around the country.